The LG G5 brought its friends to Barcelona. They range from actual robots to a DSLR-like grip. Meeting so many new gadgets at once may be intimidating, so here are some videos and an infographic to handle the introductions. First, a one minute video to dip your toes. It shows the two unique features of the G5 – the modules (camera grip and B&O DAC) and the dual camera on the back. If you want to know more, here’s a four minute video. It demoes how easy it is to swap out modules, LG even made a dance out of it. Also, LG G5‘s friends include a robot that keeps your home safe and your cat entertained. There’s a 360° camera and a VR headset you can use to view the photos. 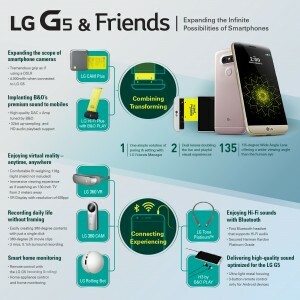 Here they all are, G5 and friends, in an infographic that gives you some more details about the sociable gadgets. And if all this seems too much to handle, the LG Friend Manager app will help you pair with and control the Friends.